Will U.S. Troops Become the Ethiopian Government’s Thugs? The most recent crisis follows accusations that Ethiopian security forces fired bullets and teargas into a crowd of an estimated two million Oromo gathered for a holy festival. The Ethiopian government says there were 55 deaths, but activists claim more than 500 people died in the resulting stampede. In addition, by at least one account the government’s recent confiscation of Oromo farmland for purposes of commercial development for foreign businesses sparked protests around the country. Lurking in the shadows of the upheaval is the United States of America. Ethiopia is among the top ten African recipients of U.S. military financing, notwithstanding complaints that the Ethiopian government has used this support to violate human rights. Even the U.S. State Department has complained about “restrictions on freedom of expression…restrictions on freedom of association, including through arrests; politically motivated trials, and harassment and intimidation of opposition members and journalists.” Nevertheless, in March the U.S. and Ethiopia signed a new security partnership agreement. 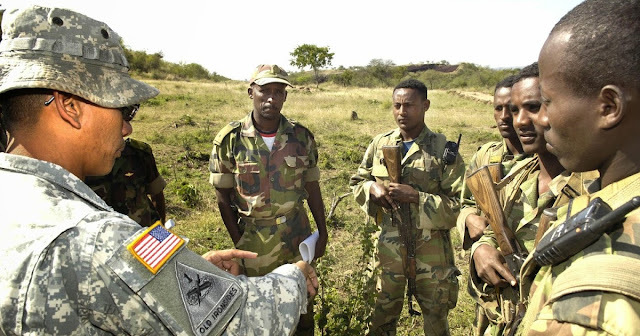 While the U.S. apparently believes this relationship is necessary because of the supposed role Ethiopia can play in combating terrorism in the region, evolving U.S. military operations in the Horn of Africa make Ethiopia a place to watch carefully in coming months. What does all of this mean if at any time protesters are perceived to be threats to foreign embassies or U.S. citizens? Already the U.S. embassy has blamed the death of a post-doctoral biology researcher from the University of California-Davis on protesters who allegedly threw stones at her vehicle while she was in Ethiopia for a meeting. Protesters in Ethiopia have also been blamed for damaging a Turkish textile firm’s factory and a Turkish owned cable plant. When commenting on the state of emergency, Ethiopia’s prime minister said: “We want to put an end to the damage that is being carried out against infrastructure projects, health centers, administration and justice buildings.” Will U.S. troops be called into Ethiopia to do battle with civilian protesters? At the time of the signing of the new security partnership agreement with the U.S., Ethiopian Defense Minister Siraj Fegessa said: “I look forward to continuing the close cooperation of our two defense forces. I have no doubts that we will turn that into a truly successful endeavor.” Speaking for the U.S., AFRICOM’s Commander David Rodriguez said: “Support between the Ethiopians and the U.S. will continue to be broad ranging, and will include equipment, training, advisory support, information sharing, and logistics support.” While visiting Ethiopia last year, President Obama called Ethiopia an “outstanding partner” in the fight against terrorists.The protests against the Ethiopian government are likely to continue, and there is potential for revolution. The U.S. may ultimately face the hard choice of deciding whether its friendship with the Ethiopian government is worth sending U.S. troops into a country in turmoil to suppress civilians who fight for the most basic human rights. Mark P. Fancher is an attorney who writes frequently about the U.S. military presence in Africa. He can be contacted at mfancher@comcast.net.